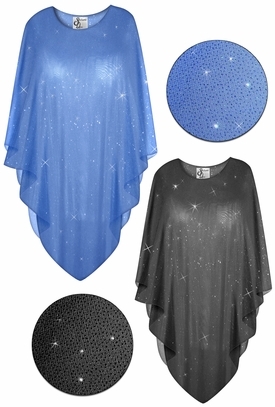 This ia a gorgeous plus size supersize poncho. The fabric is sheer and glittery, it has glitter throughout and is a very sheer type fabric with some stretch. Please note: These items are custom made to order, and normally take about 4-7 working days to create without a rush fee. Rush fee pertains to the making of the item. The rush fee is an option in this product listing. Shipping charges are chosen at checkout!